Review date: 25 August 2001. If you want to upgrade some or all of your Local Area Network (LAN) to gigabit Ethernet - Ethernet with ten times the bandwidth of the regular 100BaseT standard - then it hasn't been too hard for some time. You buy gigabit Network Interface Cards (NICs), you buy a gigabit switch or hub, you use your ordinary Category 5 cable with RJ45 connectors on it, away you go. What's that? You don't have several thousand dollars? Well, that's a bit of a problem, then. You see, gigabit Ethernet equipment is generally a bit pricey. 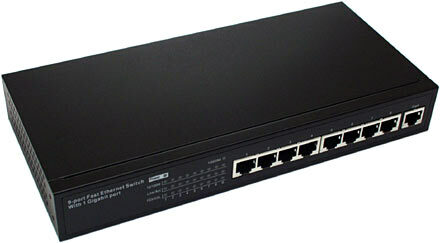 Go to your average corporate IT supplier today and ask for the gear you need to get a basic gigabit add-on grafted to your existing 100BaseT LAN, and the cheapest option they're likely to have for you is a switch with more than a dozen 10/100 megabit ports, and an expansion slot. That slot accepts the expensive gigabit port module of your choice. The gigabit module might have a couple of RJ45 gigabit ports on it, or a couple of gigabit optical fibre ports. Even if all you want is RJ45 ports, you'll still be lucky to end up paying less than $AU1500 ($US750 or so) for an un-famous-brand unit. Get one with Intel or Nortel or Cisco or Hewlett-Packard written on it and you shouldn't expect much change from $US1000. And then there's the network adapters. 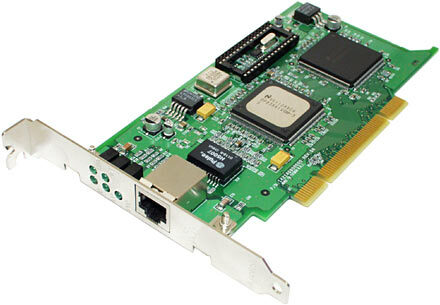 Your basic yum cha 10/100 PCI Network Interface Card (NIC) costs less than $AU30 delivered, these days. They're practically giving the things away in cereal boxes. But if you want "/1000" on the end of that specification, suddenly $AU200's a bargain price. And, again, you can pay twice or even four times that for a big-brand NIC. But take heart. You can get cheap basic gigabit gear now. In Australia, even. ...this. A Mototech US4009G switch, with eight 10/100 ports and one gigabit port. The gigabit port just sits at the end of the row of regular ports, in the same place as the crossover-wired "uplink" port on many plain 10/100 switches. Mototech are quite well known Taiwanese manufacturers of cheap and cheerful networking gear; they made some of the first cheap 10/100 switches to hit the market, and they're now doing the same thing with gigabit. ...this. One Accton Cheetah Gigabit Ethernet Adapter - Model EN1408T . PCI, 10/100/1000 compatibility. This NIC uses a National Semiconductor chipset - a DP83861VQM transceiver and a DP83821 controller. Consumer gigabit Ethernet is young enough that the chipset used by your NIC is something to which you should pay attention, if you're not a Windows user. Not all gigabit chipsets have drivers for all operating systems yet. I got a pre-release driver disk with my review card that may or may not reflect what's coming with the retail units, but it doesn't matter; Accton's download page lets you get the latest standard driver set for the EN1408T, which includes drivers for Windows 95, 98, NT and 2000, Linux, NetWare and SCO OpenServer 5.0.5a. Inside the US4009G, there's a marked lack of fans. Just heat sinks on the warm chips. If you assuming that the thing's not under-specified and will thus drop dead when summer comes around, this is a good thing. Little dinky fans inside switches have a tendency to die rather quickly, seeing as they're usually turned on all day, every day. When the fan dies, so does the switch. This is bad. Switches like the US4009G with passive ventilation will generally last much better. This one's got ventilation holes at either end of its case, so for best cooling you should mount it vertically, off the ground, so that convection can pull air through it. Put a strip of double sided tape along the bottom of the box, stick the switch to the side of a desk, and it's done. The US4009G also, I'm happy to say, has a plain old three pin IEC socket on the back of it, and an internal power supply. No unwieldy plugpack here. 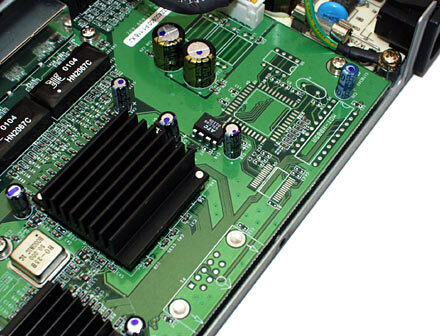 The US4009G circuit board has several blank spots for extra hardware. I presume that means there's going to be another version, with remote administration features. This is not that version; it's a plug-and-go, stand-alone, un-twiddleable box. Which is all you need for a small LAN. What, you might wonder, is the point of having one single gigabit connection to one single computer on your LAN? Well, if only one of the other computers on the LAN wants to talk to the gigabit-equipped machine at a time, there's no point to it at all. Gigabit, 10 and 100 megabit Ethernet gear all work fine together, but only at the best speed that the slowest device in any given conversation can manage. Connect a 100BaseT thing to a 10BaseT thing and they communicate at 10BaseT speed. Connect a gigabit thing to a 100BaseT thing and they communicate at 100BaseT speed. And if you connect them all up to a hub - which is just a multi-port repeater, which squirts out everything it gets on one port to all of its other ports - they'll all run at the fastest speed for which they all share support. If the hub only supports 10BaseT, then that's all you'll get from the whole setup. Switches are different. They create connections between their ports only when things attached to those ports actually want to talk to each other. Only when something fast happens to actually need to communicate with something slow does it have to drop its speed - and if something else wants to communicate with the fast thing at the same time, it doesn't have to drop its speed. The switch serves as a translation service between all of the things connected to its ports, and traffic that a port doesn't need to hear, won't be sent to it. What this means is that a switch lets you aggregate traffic from multiple slower devices to one faster one. You can have, say, five 10BaseT devices connected to a plain 10/100 switch, plus one 100BaseT file server. All five 10BaseT machines can be moving data to or from the file server simultaneously and enjoy full 10BaseT bandwidth, while the file server still has half of its 100BaseT bandwidth left. The same thing applies, with larger numbers, to this gigabit kit. If you've got a switch like this Mototech one, with one 10/100/1000 port and eight 10/100 ports, you can hook up eight 100BaseT devices to it and put your file server on the gigabit port. Now, all eight 100BaseT devices should be able to haul data out of the server simultaneously (assuming the server can deliver data that fast...), with some bandwidth to spare. Not many real networks are likely to have just eight nodes that need full 100BaseT bandwidth for some significant portion of the day, but nobody said you had to hang just one node off each switch port. 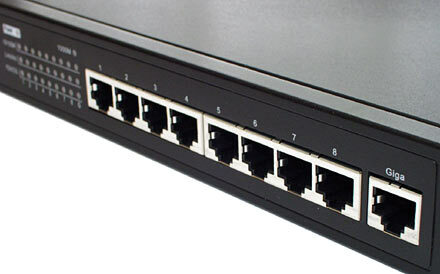 You can cascade switches and hubs together, using uplink ports (which you connect to a normal port on another switch or hub, with a normal network cable) or crossover cables (which you can use to connect two normal, non-uplink ports together). So you can hang another 100-megabit-capable switch or hub off all eight of the US4009G's regular ports, and a single server off the gigabit port, if you like. Just looking at the raw numbers, you'd think you could move almost 12 megabytes per second over a normal 100BaseT connection. A one hundred megabit per second communications link moves 100,000,000 bits per second - the "kilo" and "mega" prefixes, for communications link purposes, describe nice round powers of ten. And a byte is eight bits. And a megabyte is 1048576 bytes, because the same prefixes that denote powers of ten for communications speeds denote powers of two for storage; welcome to computing, everything you know is wrong, please enjoy your stay. So 100 megabits equals 11.92 megabytes. In the real world, though, you're unlikely to be able to move more than about seven megabytes per second of user data, in total, through a 100BaseT network. It depends on the operating system and the network protocols in use, but there's a lot of overhead in there even when you don't have multiple simultaneous transfer operations eating bandwidth. A raw-numbers calculation suggests, in the same way, that gigabit Ethernet should be good for 119.2 megabytes per second, but its real useable bandwidth is similarly smaller. And the actual transfer rates you'll get are likely to be much smaller, simply because the computers on each end of the network link can't deliver or receive data as fast as gigabit Ethernet can, in theory, send it. If you're moving data to and from RAM drives or serious RAID arrays then gigabit will give you amazingly fast throughput, even for single transfers. 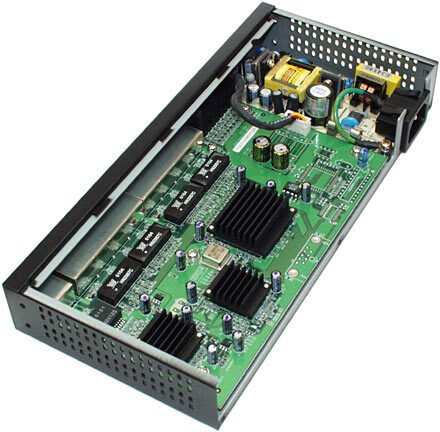 A multi-drive file server also won't have much trouble filling all of the available bandwidth with multiple transfers, if it's called upon to deliver data from about four large capacity current-model IDE drives, or a couple of high-end SCSI screamers. But if all you're doing is copying data from one computer's ordinary commodity hard drive to another's, you're not likely to see even twice the transfer rate 100BaseT gives you. Assuming that you don't have a monster file server that'd like a fatter pipe, there are still a variety of applications for a cheap gigabit kit like this. Starting with the boring stuff, how about Point-Of-Sale (POS) systems? A disturbing number of POS and similar small business networked accounting setups have one server that holds the master copy of all of the data, and has to handle a quite remarkable amount of network traffic even when only a few terminals are being used. Clever programming can get around the requirement to send huge chunks of database winging its way over the LAN every time someone buys a widget from you, but clever programming is not something that's very abundant in the glorified-cash-register world, as far as I can see. Got some sort of system with dumb terminals that get pretty much their whole screen display from a server? Gigabit may help considerably if, when multiple terminals try to update at once, everything suddenly runs like a Kombi van full of Presidential bodyguards going up a steep grade in fourth gear. Then again, gigabit may not help at all in this situation. The first thing you should check is whether the server's flogging its drive like there's no tomorrow. If your server has lots of RAM already and yet it's still flogging the drive, then a faster drive might help. If your server's slow, but isn't beating its drive to death, the culprit will very probably be either its CPU speed or its network bandwidth. If the latter, then giving the server a gigabit pipe can be a miracle cure. Gigabit's also likely to be ever so handy if you're interested in building a supercomputer in your garage. Whatever node wants the most bandwidth should get the fat pipe, and you can upgrade the rest of them as time passes, and multi-port gigabit switches and hubs become more affordable. Computing clusters (like the Linux Beowulf Project, for instance) may have spectacular aggregate processing power, but what all of those CPUs can do is very seriously limited by the bandwidth between them. Some gigantic computing tasks can be easily split up into completely separate processes that can be done by quite separate computers - consider distributed.net, or SETI@Home, or a 3D graphics render farm for that matter. But many other tasks require substantial inter-node communication. Stepping the inter-computer bandwidth of your cluster up to a gigabit per second won't turn a rack of commodity PCs into a general purpose supercomputer, but it helps. There are some less elevated applications for cheap gigabit gear. It could be worth having at a big LAN party, for instance. If you're running games which, in LAN mode, have high enough ceiling bandwidth requirements that the network clogs every time a horde of people all get together and start tossing zillions of dangerous objects around, then putting the server box on a gigabit link will cure the problem. It will also allow you to put more than one dedicated game server, your archive of hundred-megabyte patch files, and all of your copyright-free Christian folk music and wholesome pictures of fully clad non-promiscuous females on the one computer. You can do that anyway, of course, but the seven-ish megabytes per second that a 100BaseT link to such a multi-server will give you can be eaten mighty fast by a few people grabbing files at once. And then people will start whining about how they only died because of lag, and then you'll have to kill them, and then there's that whole boring disposing-of-the-body thing to deal with. Until very recently, adding some gigabit gear to your LAN was a nice idea. But it was in the same category as owning an island, or a Commissioner of Police. That'd be nice too, but who can afford it? Now, though, a kit like the Gigabit Network Combo lets you get a switched gigabit pipe to whatever node needs it for less money than a lot of places charge for a single lousy gigabit NIC. Small businesses can afford this stuff now. If you don't have a need for more speed than 100BaseT gives you, there's no reason to spend bigger bucks for gigabit. If 100BaseT's fine, then you only need $AU30 for each network card and $AU165 for an eight port 10/100 Mototech switch. Delivered. Can't argue with that. But if you feel the need for network speed, now's the time to come and get it. You can't buy this kit from Aus PC Market any more; they have cheaper networking gear available now. If you're not quite up to speed with the networking terms in this review, you might like to check out this Ethernet Networking Explained piece.